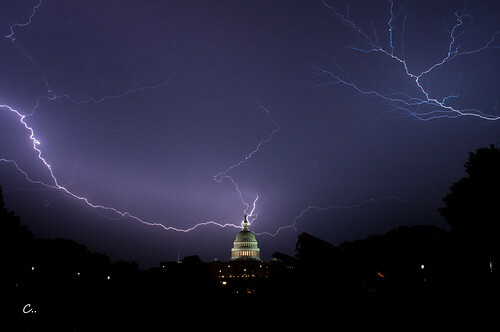 More than a quarter of DC area households remain without power this morning in the wake of the severe storm that hit Friday. OPM and many state and local governments have placed their staffs on liberal leave and telework this morning ahead of the start of the holiday week. At the storm’s height, more than 1.5 million power customers were without power as the 60-80mph winds tore through the area late Friday night. Power remains out for more than 650,000 homes this morning as Pepco, BGE, Dominion Virginia and others work to repair the damage caused by falling trees and other debris on the power grid. Current restoration timelines are fairly dire at this time, with Pepco releasing a power restoration target of 90% of their customers by Friday. Dominion Virginia’s picture is a bit rosier, with 85-90% of their customers expected to have power by Tuesday, while BGE expects that their repairs will take through the upcoming weekend. Temperatures are expected to rise into the mid and upper 90s through most of the week with high humidity which certainly looks to make for an uncomfortable week in the nation’s capital. Cooling centers have been setup throughout the affected areas and will provide some relief for affected residents, some of them are staying open 24/7, but check with your municipality for the latest timing. Pepco is currently in the process of asking for a rate hike for its subscribers in the District and Montgomery County, which should go about as well as you might imagine given the abysmal restoration timelines and the inability to draw peer workers to clean up the storm. More than just the power, Internet access has been dramatically affected throughout the metropolitan area. RCN is citing a fiber cut for many of its outages and the inability to repair until Pepco permits them to work on their broken network. Comcast, while not citing specific issues, says that they are working closely with emergency personnel to repair the damage, but neither Comcast nor RCN would offer any kind of timeline toward restoration of services. On a more personal note, I wanted to say how proud I was of all my DC friends, I saw a lot of good neighbors out there taking in their friends, taking in strangers even, during this storm. This is the sort of thing that builds community, through the difficulty. The outpouring of support throughout the various neighborhoods, despite variegated disputes over budget priorities and zoning and even the littlest thing. This is a town that can pull together when it matters, and that is always heartening. And we did it all with our mayor 12 timezones away in China. Not bad, DC. Not bad at all. I don’t even think Mayor Barry pulled that one off during a disaster. I think they most he ever did was allegedly OD at a Super Bowl weekend concurrent with a major snowstorm.